In the US, I am not only nothing, I am less than nothing. I am less than double nothing in fact, and that's not for lack of confidence but for lack of size. As stores move the size names up, I find that sometimes even the newly invented American double zero (00) is too big for me, as is the XXS (because one X just isn't enough). Granted, I am 4'11" (in shoes), so I would expect to be the tiniest size, but I do still have mass and substance, so I would expect to be more than less than nothing. In France, they do things differently. 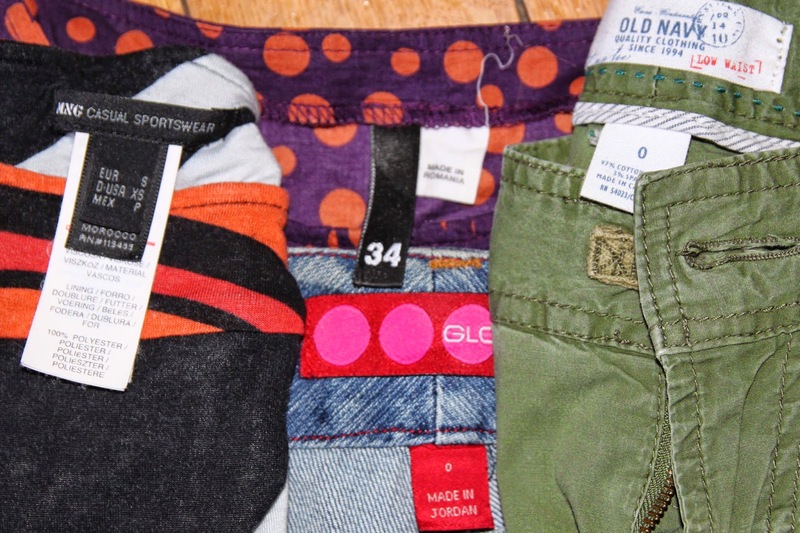 Of course, there's still a little salesmanship in it, and one of my friends, who's a size 38, says her husband teases her that "Everybody is a size 38." Well, not me. I'm usually a 36. Sometimes, depending on the maker, cut, and style, it's a little too big for me, and if I'm lucky there's a 34, but usually they don't make or stock smaller than 36. That makes sense, though, since at 150cm (in shoes), there may be some adult clothing that just isn't made for masses of people my size. I understand. No really, I under...stand. But I do appreciate that a size 36 still sometimes fits me and that French manufacturers have not done the size creep and left me naked on the streets of Paris. You know those curves that chart your children's growth? To my amazement -- to my complete and utter astonishment -- here in France, my girls are almost exactly at the 50% mark for their age. To put this in context, not only I am only 4'11" / 150cm (in shoes), I actually grew over 2" (5cm) at university. So you know I never saw the 50% line on that curve. Well, maybe I was just in the wrong country. Because while my girls are at the 50% line here in France, and are, in fact, fairly average-sized among their friends of the same age, they are the tiny little pee-wees you would expect my children to be compared to their American friends. They are generally a full head shorter than their American peers, and many of Pippa's friends are taller than Gigi, who is two years older. 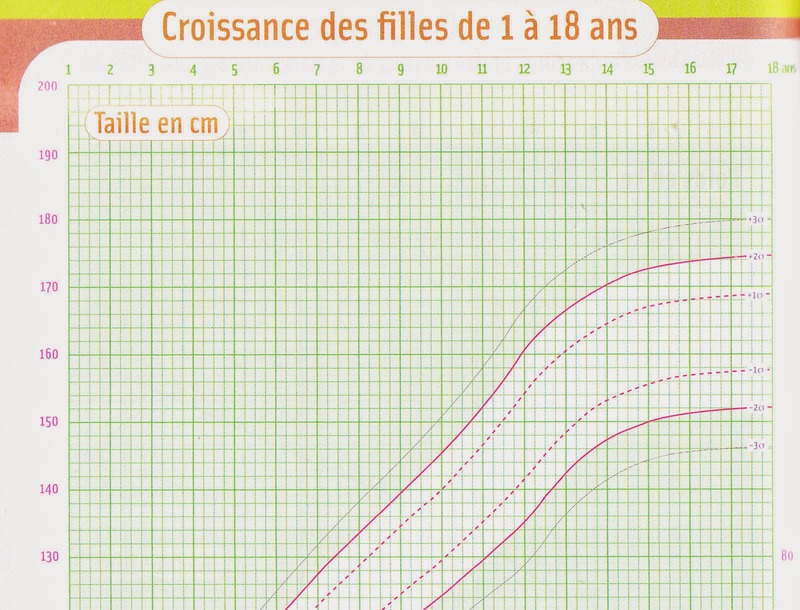 In fact, on the US growth charts, both girls are between the 10th and 25th percentile, somewhere around the 15% mark. The proof is in the pudding: these French girls in the photo below are all one year older than Pippa. She's the same height as two, and just slightly shorter than two. And the one girl who's a head taller than the rest is an American here on sabbatical. We notice this especially wen we buy clothing. Gigi, who is turning 11, still wears size 7 or 8 clothes from the US. In fact, sometimes even the size 8 is too big (especially around the waist, truth be told). Whereas here in France, we are currently buying her size 10s and even -- sometimes, gasp! -- a size 12. The daughters of one of my American friends here in Paris were both born in the US. Due to medical protocol, one of them had to be followed for a year around age 4 for "failure to thrive" because she was lower than the 5th percentile in height/weight. Then she moved to France and found herself just under the 50th percentile. Oddly, the French like to use the sizing convention "XS, S, M, L, XL, etc. ", even though these are Anglophone references -- the French word "extra" meaning "wonderful" and not "more than usual". An American teenage friend of ours was just visiting France and, upon trying on jeans for teens that actually fit and did not fall down on her thin frame, proclaimed joyfully, "In France, I'm actually a normal size!" Well, I may not be a normal size here, or anywhere, but at least I'm not nothing. And that's something. The Vacher Vendéen is, as the name suggests, a cheese from the Vendée made from cows' milk, in this case pasteurized. This particular round is a Mini Vacher Vendéen, with a natural, moldy crust. The lady at the grocery store gives me a sample, and I'm happy not to have to buy the whole cheese, mostly because it's got that same taste that so many of the Vendéen pasteurized cow's mild cheeses share: half-stinky yet a little bland, and half-rubbery, too. It's not that they're bad, so much as they're simply unmemorable. This cow claims to be mini. It's small, sure, but is it actually mini? That's pushing it. It's the diameter of a CD, not a coin, and the thickness of a Dickens novel, not a magazine. Now if you're a small cow, does that make it a big size? Or a small number? Really, who can tell what these size names mean anymore?